Families from Afrin who fled to Turkey's border province of Hatay from the persecution of PKK-affiliated groups are preparing to return home now that the town has been cleared of terrorists. Living in Hatay's Reyhanlı district on the Syrian border, Afrin locals described the oppressive practices of the People's Protection Units (YPG), the PKK's Syrian affiliate, including extortion and forced recruitment. 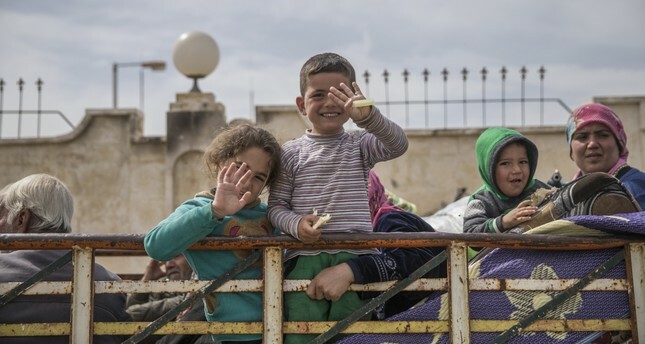 Hasan Abu Ali, a school director who fled from Meryemin village in Afrin to Reyhanlı, said they fled to Turkey out of fear for their children's safety, adding that YPG terrorists killed his relatives and destroyed his house. "They were trying to recruit youth the most. When you rejected their practices, they damaged houses. They did everything to enforce their decisions," he said. Abu Ali also expressed happiness for the successful completion of Operation Olive Branch. "Our relatives started to return to their homes. There is no more fear, and no one that will persecute us anymore," he said. Talal Kerduş, a father of 10 who fled to Reyhanlı, said they are relieved that Afrin is free of terrorists. "We came here because of the persecution and oppression. We witnessed many bad things in our hometown. But hereafter, we won't feel fear or concern," he said. Turkey launched Operation Olive Branch on Jan. 20 to clear terrorist groups from Afrin in northwestern Syria amid growing threats in the region.